Young men gather around a vessel of bright pigment in preparation for body painting in this scene by artist Reeda Peel. In prehistoric times, ocher pigment had many uses, whether for body adornment, massive scenes on cave walls, or small painted pebbles"portable art." Although Kincaid Shelter had no preserved wall art, investigators found decorated stones and evidence of pigment production. Cut marks and shallowly drilled holes have created an animal-like face on this hard, red ocher nodule, giving it the shape and appearance of a small totem, or other special symbolic object. TARL Collections. Click to enlarge and see reverse. Ancient artisans were at work at Kincaid throughout much of its history. They selected flat pebbles on which to engrave intricate patterns and make odd scratchingsdesigns that puzzle us today and cause us to ponder their meaning and significance. Some of the work is finely executed with parallel lines, grids, concentric circles, cross hatching, and other geometric patterns. Other designsparticularly the marks on red and yellow ocher cobblesappear more random, as if someone scratched the surfaces repeatedly and from different angles. Unlike the engraved objects, these "scratched" stones likely were not "works of art," as we understand the concept, but rather the "ingredients" of art. Scratching ocher stone with a sharp tool or crushing small ocher nodules produces a fine, pigment-rich powder thatwith a few added ingredients such as animal fatbecomes paint. Working with a brilliantly hued palette of reds, oranges and yellows, artists could paint designs on hides, small pebbles, and cave walls, as well as bodies and faces. There are other odd stones at Kincaid that apparently were used for more practical purposes. 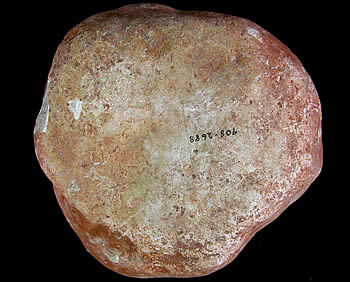 Several large, flat pebbles have random marks suggesting that rather than pigment extraction, the stones were used as a hard surface for cutting soft materials. And a number of curious, small, flat limestone pebbles appear to be unmodified, devoid of any markings at all. The stones are chiefly Edwards limestone, which does not naturally occur in the shelter (Anacacho limestone formation). Clearly, prehistoric workers gathered these small pebbles from the river gravels and brought them into the shelter. Were these blank "canvasses" stockpiled for future artistry? Or were some once painted with special designs that have faded away with time and weathering. As you look at the various types of stones, below, perhaps you will have your own ideas about their meaning and significance. As will become evident, the stones cannot be neatly classified; some clearly were used for one or more different types of practical tasks, while others were more esoteric and served purposes we cannot know. For a closer look, images can be clicked on to view enlarged versions and, in some cases, the reverse sides of artifacts. In some images, contrast has been heightened to capture more detail. Many of the engraved and scratched stones as well as a quantity of the pigment stones from Kincaid were found in Zone 5, a few were from Zone 6, but there were many others found in disturbed fill, making it impossible to infer a relative time period for their production. Based on information from other sites, however, it appears that art in many forms was significant to prehistoric peoples, from the Paleolithic painters of the Old World to the most ancient Texans. All of the specimens shown are curated in TARL Collections, available for examination by qualified researchers. Like a medieval maze, the designs on this palm-sized engraved stone form a tight spiral of concentric circles. The pattern expands to a network of rayed lines, as shown in the drawing above. 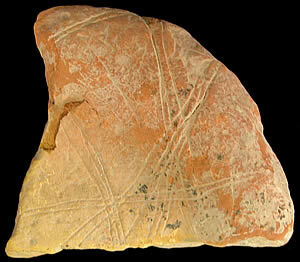 This motif, referred to as a spider-web pattern by some researchers, appears on a number of both painted and engraved specimens found in the dry shelters of the Lower Pecos region. TARL Collections. Photo by Aaron Norment; drawing by Hal Story. Click to enlarge photo. 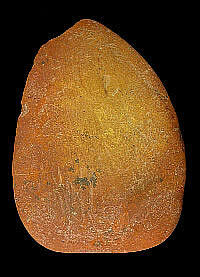 Found in Zone 5, this bright ocher pebble has lines engraved on a flat surface; the reverse face is rough and convex. TARL Collections. Photo by Aaron Norment. 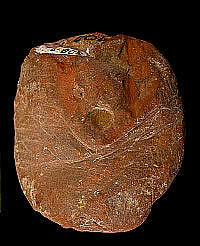 A design of concentric circles, similar to the specimen shown above, right, is faintly visible on this flat yellow pebble found in Zone 5. The reverse has a very delicate grid with patterns of three and four parallel lines devolving into more random scratchings. TARL Collections. Creating an engraved work of art must have been far more difficult than painting a pebble with a brush. The close work would have required a very sharp tool, such as a chipped stone graver, as well as good eyes and a steady hand. Perhaps for that reason, engraved stones are rare in Texas. Yet, interestingly, there are strong similarities in design motifs even within the small assemblage of known specimens. 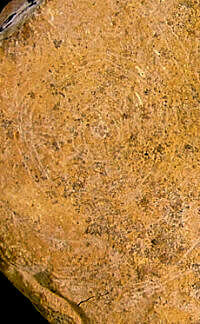 The concentric circle motif, shown on specimens at top right and below left, is nearly identical to that on an engraved pebble found in Val Verde county. And there is a counterpart for this design in a painted version, seen on some of the painted pebbles of the Lower Pecos. 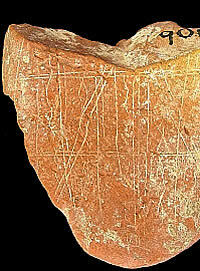 Stones with painted concentric circles and rayed lines were found at the base of Fate Bell Shelter and the base of Eagle Cave in Val Verde County. Click to see examples from other sites. Archeologist and ethnohistorian Shirley Mock believes the concentric circle pattern is an ancient design drawn from myths and legends of the Southwest focused on the spider and a recurring character known as Spider Grandmother. In her 1987 thesis on painted pebble designs Mock explains the myth further: "By spinning ropes , Spider Grandmother was able to fasten the sky and earth together. Among the Plains Indians Spider Grandmother wove a magical spider-web by which she was able to control and produce buffalo." In his stylistic study of painted pebbles from the Lower Pecos, archeologist Mark Parsons placed the circle motif chronologically at the beginning of his sequence, dating perhaps to 8500 B.P. As T.N. Campbell has noted, "It is clear that the designs on both painted and engraved pebbles were taken from the same design pool, as is shown by cross-hatched surfaces, various arrangements of parallel lines, and stylized female figures." Quite different and far earlier examples have been unearthed at the Gault site in Bell County. There archeologist Michael Collins and his team have recovered finely engraved pebbles from Clovis and later contexts. 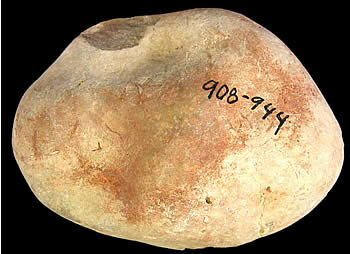 A single engraved stone was found in early Paleoindian contexts at the Wilson-Leonard site, and another in the Blackwater Draw Folsom component. These are among the earliest, securely dated engravingsand perhaps the first artin North America. A pattern of diamond latticework adorns this thin pebble of silty ocher. There are no marks on he reverse. TARL Collections. Click to enlarge. Elaborate patternsfrom thin chains to sets of two, three, and four parallel lines with hatch markscover one surface of this rounded pebble fragment from Zone 5. TARL Collections. Photo by Aaron Norment. Click to enlarge. 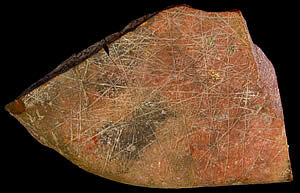 Deep engraved lines adorn this fragment of red ocher. 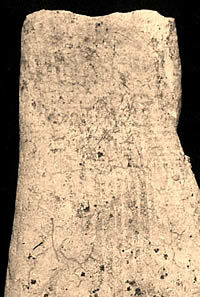 Although heat has spalled off the back of the object, lines extending over the edge suggest that both faces were once decorated. TARL Collections. Click to enlarge photo. Click here to see reverse face. 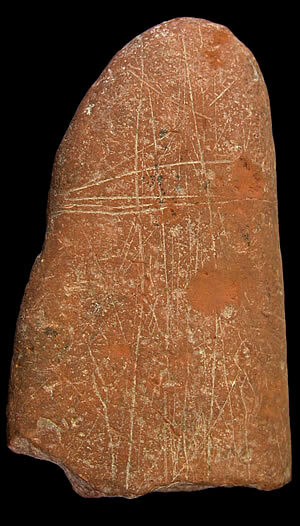 Faint, incised geometric designs appear on one side of this small pebble of red ochreous limestone from Zone 5. TARL Collections. 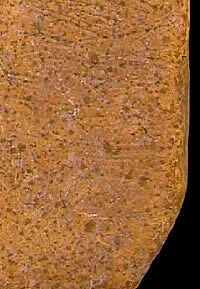 A fragment of a disc-shaped pebble is deeply engraved on both faces with a curved grid of parallel lines that extend over the rounded edges. Found in a backfill pile, the stone is a pure yellow ocher that, although very hard, leaves a powdery residue on the hands. TARL Collections. Click to enlarge. Click here to see reverse face. Scratched Stones: Art, Pigment Production, or Cutting Surfaces? This large, flat slab of ocherous gypsum has a slightly depressed surface with random and parallel scratch marks. Photo by Aaron Norment. 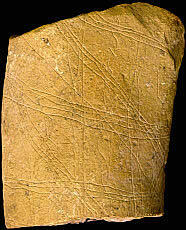 or are these just the marks left behind by a prehistoric tailor, cutting up pieces of hide on a smooth cutting surface. Click to see full stone. More clearly appearing to be related to ocher production than some of the other stones, this soft, flat pebble from Zone 5 has scrape and scratch marks. The Kincaid data suggests a special interest in painting other than in rock art, which is minimally represented at the site. One thinks immediately of body painting, especially in connection with ceremonial activities. 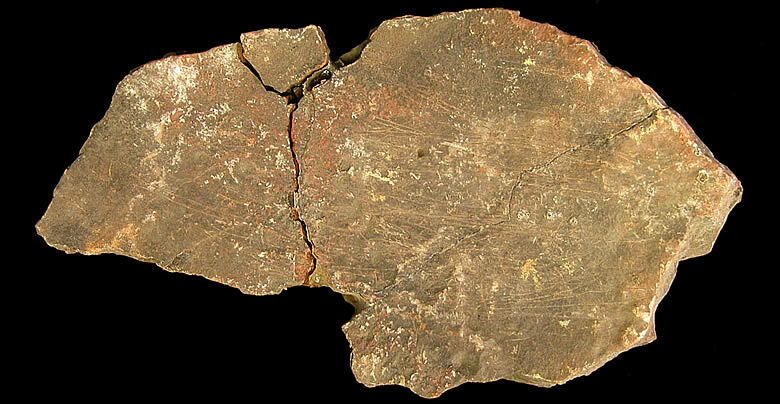 In the dry rock shelters of the western Edwards Plateau, archeologists have recovered a few small pieces of dressed animal skin with traces of painted decoration. Unfortunately, the damp conditions at Kincaid Shelter would have destroyed such perishable material and most other evidence of painted art work. Evidence from other sites suggests other uses for ocher, including an ingredient in mastic for hafting stone points on weapons and tools. Ocher also has been found in many burials at sites across the world, suggesting a ceremonial or symbolic meaning. 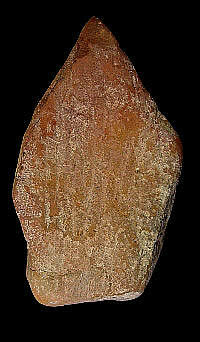 Red ocher has filled in scratch and cut marks on this cobble of ochreous limestone from Zone 5. 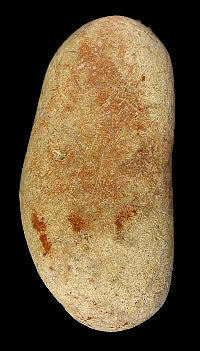 This brilliant heart-shaped ocher pebble has scratch marks over its one flat surface. Faded geometric painted signs are barely visible on this elongate limestone pebble. A few ocher-splotched and stained cobbles and a long pebble with only a shadow of its design remaining are other evidence of pigment production and painting at Kincaid. The stained cobbles may be the result of a careless painter or pigment maker; two have scratch marks and smoothed surfaces, indicating additional functions. 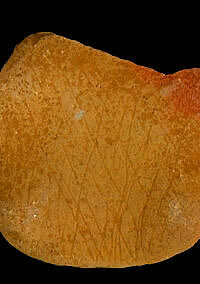 Scratches are evident among the red ocher splotches on this cobble. Red ocher coats the sides of this large limestone cobble found in Zone 5, perhaps used to crush or pulverize pigment. 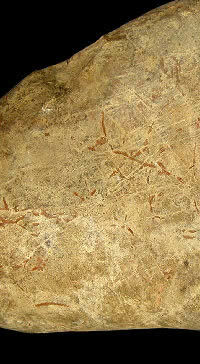 A bulbous limestone cobble with splotches of ocher stain, found in Zone 5, may have once had an intended design or may have been the result of a painter's carelessness or perhaps this stone was pressed up against an ochre-painted object. In his analysis of the Kincaid collection, Campbell found that a quantity of pebblessome 130 of themwere "blank," apparently unmodified in any fashion. Most are small, flat, pebbles of grayish Edwards limestone. He wrote, "Whether actually used or not, all were brought up from the river for some intended use. They are not naturally occurring in the shelter." At other sites, especially rock shelters in the arid canyonlands of southwest Texas, investigators have seen a similar pattern. At Eagle Cave, for example, some 400 unmodified pebbles were collected. The reason for special interest in pebbles of this region is quite apparent: Some of the prehistoric populations of the western Edwards Plateau and adjoining Lower Pecos painted interesting designs on flat pebble surfaces. Since the paints did not always survive the years, investigators collected miscellaneous pebbles to inspect closer in the lab. These microscopic inspections often revealed faint marks made from sharp-edged tools, others lightly engraved. The Kincaid artifacts have not been fully analyzed or examined microscopically. There are, however, several other interesting explanations for their presence at the site. 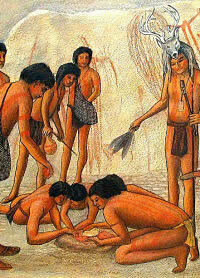 Historic accounts of native peoples, such as the Tarahumara Indians of Chihuahua, record the use of small pebbles for both ritualistic and mundane uses. Anthropologist Carl Lumholtz, during his late 19th-century visits, noted that shamans rubbed small stones over male athletes prior to games, and that women carried small thin stones to protect them against sorcerers. Other enthnohistorians have described the use of small pebbles as gaming pieces. Whether the Kincaid pebbles were "blank canvases" stockpiled for future artistic endeavors, or whether they served some other use, is unknown.